I never thought I’d get to use that as a blog headline. So, March 6th! Fine food! Fine company! And the opportunity to become skilled in the equisite art of trail building! How can you refuse? Oh, and speaking of Trail Pixieism – section 11 is closed for repairs to the surface. Do be good and stay off while it beds in, won’t you? You know all the rain we’ve been having? Well that’s because for every closed trail ridden, every piece of litter dropped, and every corner deliberately skidded around, a trail pixie sheds a tear. Don’t make the pixies cry! Finally received a reply from Jeremy Wright MP. The reply was surprising in some respects, less so in others. I guess I’d already resigned myself to it being a fairly cut and paste job – there were a few insults thrown at the Labour party (they did it first, but worse! ), and general reassurance that selling off the forests was the correct thing to do because they’d be better managed and it’d reduce the conflict in interest in having the FC regulating the timber trade whilst also being a producer. I really don’t know if that’s his genuine opinion, or if he just puts the party line ahead of constituents’ concerns. The other surprising thing was he replied by mail. As in, ‘letter on paper through the letterbox’ mail. Blimey. I would have preferred an email – it’s how I contacted him, and I was always told that responding in the same format as one had been contacted in was preferable etiquette. Not to mention that emails save paper and ink, so is better for the environment, and also saves money on customised stationary. MP stationary is HEAVY. The paper quality is Proper Posh (TM) – weighty, nice finish… you could paper a room with it! And maybe an email would take slightly less than two weeks to arrive. But all that is fairly moot, as two days later the government did a much-welcomed U-turn. I guess having the majority of voters (regardless of political persuasion) hating you is probably a bad thing. In a way I hope it might turn out to be a good thing – the government have seen how far and wide opposition to the plans are, they’re now going to have to ensure access rights to the smaller amount land they do sell off or lose face… and most importantly, people are now more likely to be aware of any future sales, and know that people power and community concerns can work for change. 2) Online retailers who have a rubbish returns policy. Two weeks before our holiday, I ordered three pairs of 3/4 length shorts. The day before our holiday, the package arrived. It didn’t contain shorts, oh no. It contained three pairs of skinny leg jeans. Three pairs of UK size six skinny leg jeans. I am many things, but a UK size six is certainly not one of them, and certainly not when it comes to the hips department. Now, the online retailer who shall remain nameless have a curious returns policy – they have a courier come and pick up the parcel. In theory, that’s great. Except they’ll only pick up from the delivery address, and don’t turn up when they’re supposed to. We’ve wasted two Saturdays waiting in on the courier, which was particularly bitter this weekend just gone given how nice and sunny it was. So in short, they sent me the wrong stuff late, and it’s taken me a couple of weeks to get them to pick it up. If they start whining about how it’s outside the 14 day return period, I’m going to be very miffed! Very miffed, I say! 3) Jeremy Wright MP. Oh Jeremy, why must you play so hard to get? It’s been two weeks since I contacted you, and you’ve not even bothered to fob me off with a generic reply about why the government is right in selling off the forests. You just ignore me, Jeremy, and it hurts a girl’s feelings. I even went to extra special effort to make sure I was civil, and used paragraphs and punctutaion and everything! It had been over two months since Id been out on the bike, but with the temperature taking a distinct upturn (13 degrees! Oh my!) it was time to WTFU and get out there. I have to admit, initially it was harsh. I decided that, given my time off the bike and delicate health (still coughing up slime) Id build up my fitness and get used to being back on the bike by doing the blue route, rather than throwing myself onto the red whilst I was still a bit out of sorts and the trail is very slippy. As I got on my bike I felt pure joy  Ive not really gotten outdoors much over the winter. Five minutes later, mentally I was still feeling the joy whilst my body was starting to protest. After 10 minutes my body was screaming in protest  knees killing, coughing, chest hurting  and mentally I was starting to ponder if I should potter around the greens instead. However, the urge to WTFU was too strong, and I carried on  fortunately after 15 minutes I was fine, I think I just needed to warm up! Although my knees were killing by the end, Im determined to get more biking in this year, and to get fitter than Ive ever been (which isnt that lofty a target, ahem). I want to get on the red trail as soon as possible, because I dont want to keep putting it off and building things up to being miles worse than I imagine them to be  again, my stomach turns slightly when I think of the last few steps on the turn out of the Stegosaur onto the bridge, even though Ive ridden it numerous times without incident. But theres no point throwing myself straight onto it when Im still feeling a bit under the weather, my fitness has gone to pot (albeit a delicious treacle pudding and custard infused pot) and the trail is slippier than an MP making an expenses claim. I think the trail has quite enough braking bumps without me contributing to them! Speaking of contributing, another aim of mine is to attend more trail building days  regular Sunday ones as well as the Big Build Days. 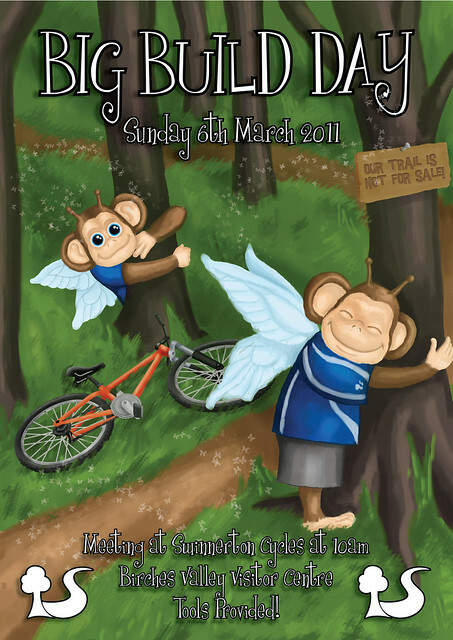 Theres a Big Build Day on March 6th, so Ill definitely be along to that, going to try and get a few Sundays in too! And speaking of slippery MPs, have you all contacted your MP about the proposed sell-off of Englands forests? If not, you should  many of the paths used by mountain bikers, horse riders and walkers that wind though Forestry Commission forests arent official rights of way, so theres no guarantee so far that they would be honoured by private owners. I contacted my MP over a week ago. Not only did he vote down the motion to stop the forest sell-off, he has (so far) also failed to reply. I was actual civil as well! POOR, POOR SHOW, JEREMY WRIGHT OF KENILWORTH AND SOUTHAM. I think Im probably more disappointed in Aidan Burley, the MP for Cannock Chase. Hes expressed his concern at Cannock Chase not being given Heritage Status and having less protection than the Forest of Dean and the like, but still supports the sell-off of the English forests. Well, he voted against the motion to stop the sell-off, so Ive heard. So its OK if other forests around the country are sold off and limited in access, but not the one in your back garden?